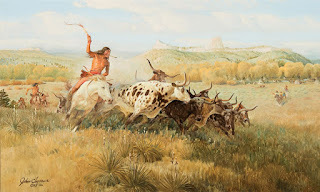 Scottsdale Art Auction posts an impressive $10.87 million sale (hammer) and a 90% sell-through rate. 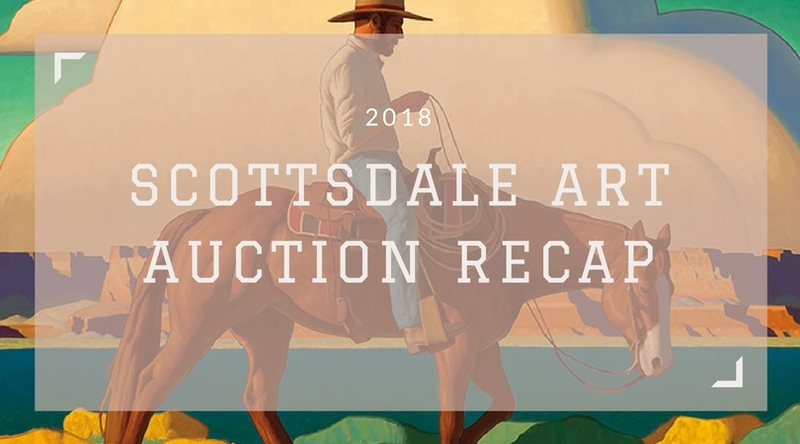 It was hot in Scottsdale with unusual temperatures in the 90's for this time of year, and with active bidding coming from the floor, telephones and from the internet, the Scottsdale Art Auction was also hot! 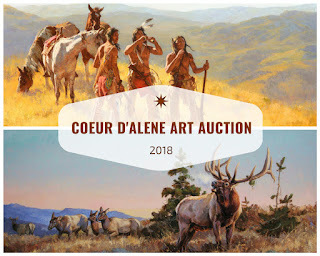 The first session of the auction was all no-reserve, and patrons loved the idea of no reserves and not having to worry about ceiling bids to get to a reserve. There were plenty of highlights throughout the sale, but once again, the cookies may have stole the show. I think there may have been as much talk about the delicious cookies that the auction serves as the works of art in the sale. I'm not going to lie, they were really delicious, and I don't think anyone ate just one. It looks like Scottsdale Art Auction may have found something to compete with Coeur d'Alene's lamb chops. I'm happy to eat crow, because I wasn't sure if they would hit double digits without a signature painting over a million dollars, but the partners proved me wrong with solid results across the board. With nearly 400 lots, the biggest price realized wasn't the Moran or the Russell, but Spotted Buffalo by John Clymer. The bidding was like a tennis match between Federer and Nadal as two bidders went back and forth for the right to take the painting home. It ended up selling for $468,000 including the premium. Thomas Moran's Solitude, The Coconino Forest realized $438,750, and the cover piece Indian on Horseback by Charles Russell sold for $321,750. Of course, my favorite painting passed, then was sold immediately after the hammer dropped. That painting was Carl Rungius' Old Men of the Ram River. A collector got a really nice painting by Rungius for a great value. There were plenty of other highlights that drew applause once the hammer fell. Tim Solliday's Horse Trading sold for $64,350 with a $24,000-$34,000 pre-sale estimate. Joseph Sharp's The Artist in the Studio Mirror was a very unique painting and bidding between museums drove the price to $204,750 after a pre-sale estimate of $70,000-$100,000. 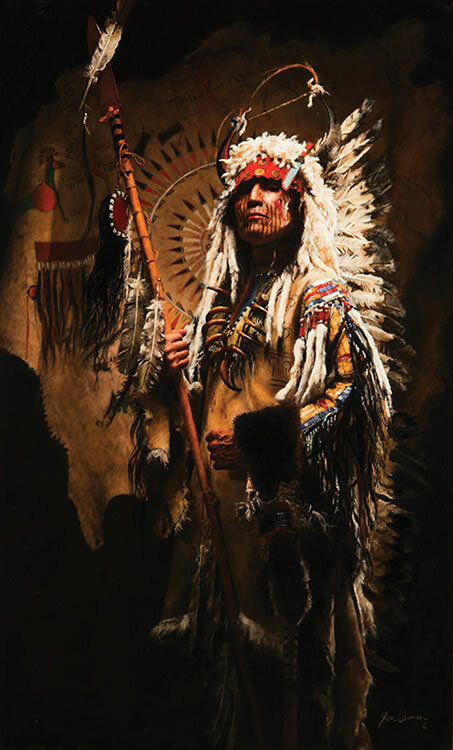 Logan Hagege's Winding Down, which starred fellow artist Glenn Dean as the model, sold for a strong $58,500. 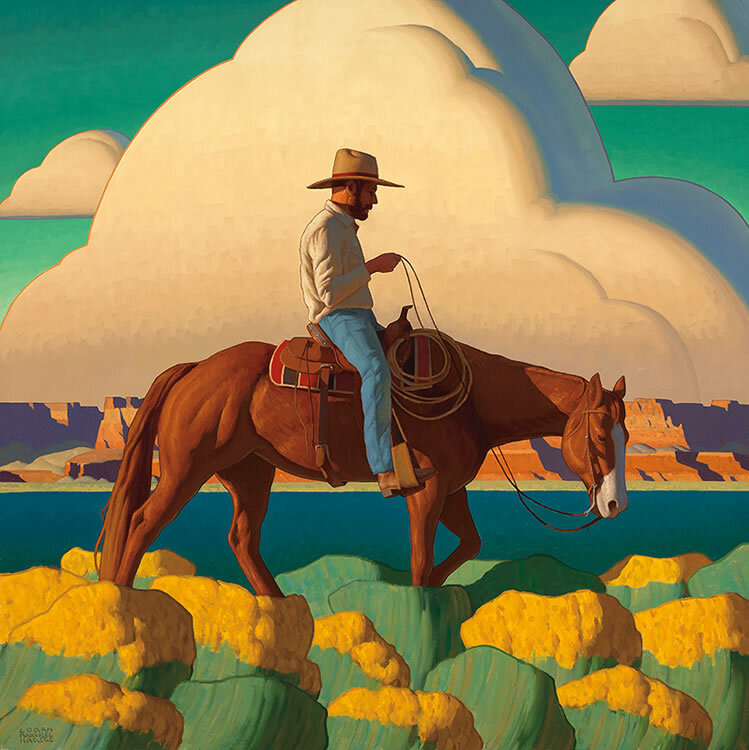 Be sure to check out Logan's upcoming one-man show "Where Land Meets Sky" at Gerald Peters Gallery in New York opening on May 11th. Best of luck my friend! I know it's going to be a sellout show! Another lot that brought an applause was John Coleman's Four Bears, 1833 which sold for $157,950 with an estimate of $60,000-$70,000. Neither bidder wanted to give up, and with each bid, you could see John Coleman's smile get bigger and bigger...even through is terrific mustache! As expected, the G. Harvey market continues to be very strong as all seven works in the sale sold and sold well. Rocky Mountain Cowhands fetched the highest price of $198,900 and When Lightning Rules the Sky fetched $187,200. G. Harvey is a very popular artist who is known throughout the country, and I thought there might be a dip in his pricing with a saturation of works hitting the market, but the demand for his work continues to be strong even after his passing. The Kyle Polzin market doesn't seem to be slowing down either. Polzin doesn't do very many paintings per year, so they're tough to acquire, so it makes sense to see the aggressive bidding for his work. 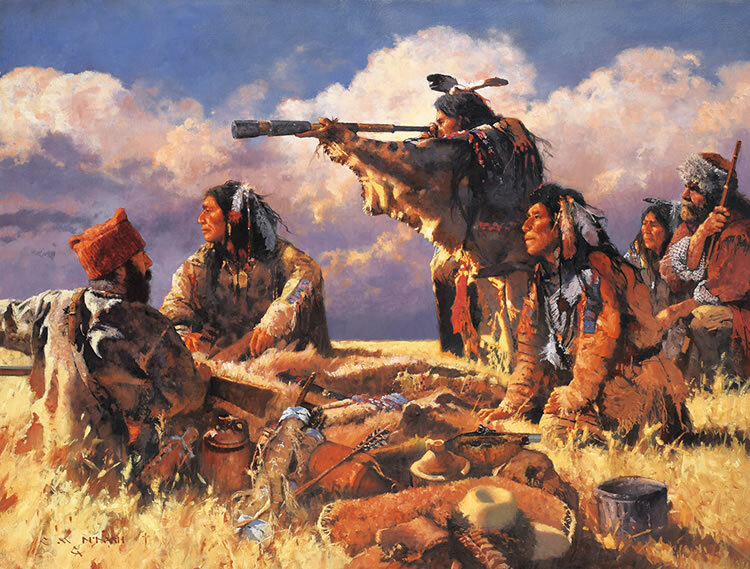 Finally, Michael Dudash continues to impress with his painting Spyglass realizing $43,875. Michael continues to grow in popularity, and I'm not surprised when you look at all his collection factors. I've also seen him paint, and he makes everything look so easy. There's just a few artists throughout the Western art world who can paint a complex narrative painting, and Michael's work is the best value of them all since they're not six figures yet. Be sure to catch Michael Dudash, along with Martin Grelle, Brent Cotton and Jeremy Winborg at my Collector's Rendezvous at Quinn's Hot Springs Reosrt. There are still a few rooms available if you want to attend, and feel free to contact me for more information. I just want to share a few observations as I wrap up the 2018 Scottsdale Art Auction recap. 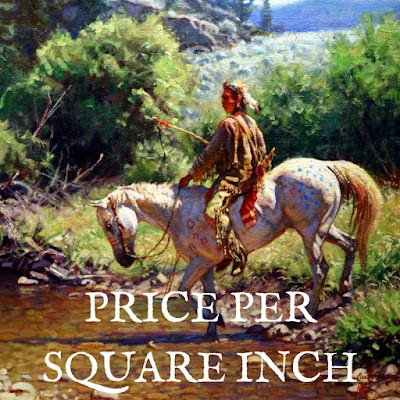 First, the Western art market seems very healthy to me, especially after the strong results from this sale. Combine that with the success of other recent major Western art shows/sales, and it's safe to say that collectors are confident in acquiring quality works. Next, I am seeing new buyers at every show I attend, which is very encouraging. I hear people always saying we need to reach young collectors, but I disagree. We need to reach out to new collectors, as the largest segment of buyers remains in the 50-65 age range. There isn't a large percentage of younger collectors with discretionary income, because we're all still paying overpriced student loans. However, there are plenty of collectors who are moving into the "downsizing" segment, and as they do, plenty of people are reaching their prime in regards to discretionary income. Finally, I've been attending the major auctions for over a decade, and this year I noticed there was probably the smallest number of dealers in attendance. I didn't see the usual suspects from around the country who are normally there to buy for themselves and their clients. I think it's indicative of how everyone is buying their art. There's more online bidding than ever, and it's just as easy to bid by phone without the travel expenses. It just means more cookies for me!